Canada is on the brink of an economic transition and a new report co-authored by Delphi, Green Building in Canada: Assessing the Market Impacts & Opportunities, demonstrates that the green building industry will be an important part of that transition. The report shows that the green building industry generated $23.45 billion in GDP and created more jobs in 2014 than Canada’s oil and gas extraction, mining and forestry industries combined. The global green and sustainable building industry is projected to grow at an annual rate of twenty three percent between 2014 and 2017. Canada, a global leader in green building with the highest number of LEED buildings per capita in the world, has an enormous opportunity to capitalize on export and job creation opportunities. 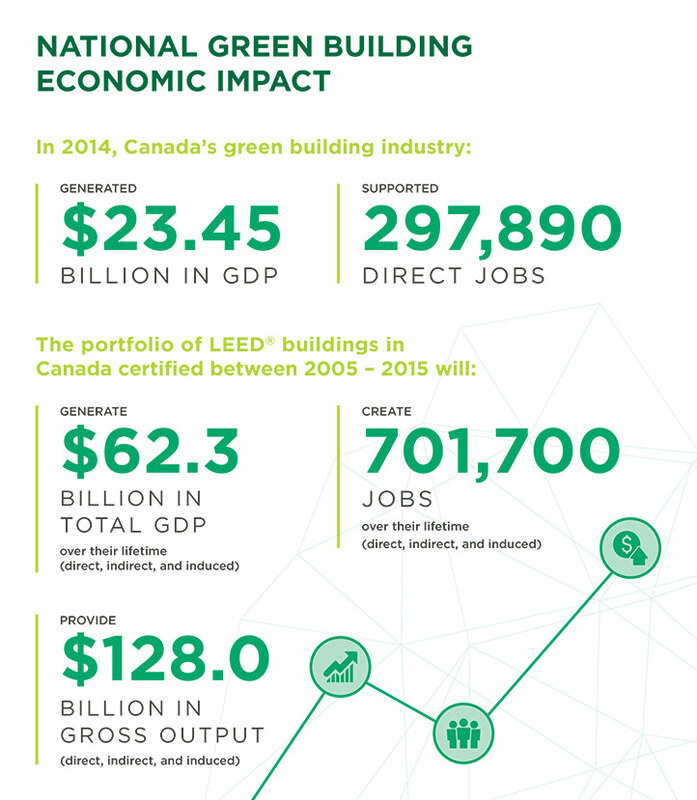 LEED projects certified in Canada between 2005–2015 will lead to $128.0 billion in gross output over their lifetime and $62.3 billion in total GDP, and will create 701,700 jobs. Ontario and British Columbia have more green building jobs as a percent of their total labour force than any other areas of the country in 2014 – equal to 2.1 and 1.6 percent, respectively. This is due in part to greater market leadership, progressive building code requirements, and provincial and municipal green building policies. LEED certified buildings in Canada, on average, provide net savings of approximately $294.31 per square meter over their economic life time for building owners / occupants, based on the average energy, water, waste disposal, and operational (O&M) savings. The market penetration of LEED-certified buildings in Canada has been growing over the last decade, from 0.8 percent across all asset classes for the period of 2004-2009, to 10.7 percent for all new construction floor space in 2014. Of these, 22 percent all new commercial buildings, and approximately 30 percent of all new institutional buildings constructed in Canada in 2014, were LEED-certified buildings. The Green Building in Canada report also makes a number of suggestions on how to accelerate industry growth and maximize economic opportunities. Click here to access the executive summary of the report.